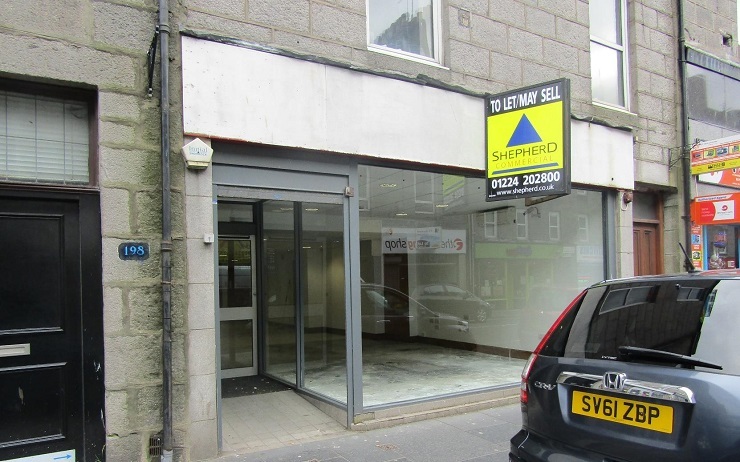 Shepherd Chartered Surveyors is marketing an outlet on a busy retail pitch with high footfall in Aberdeen’s city centre for lease or sale. Located within an established and popular retail location a short distance from Union Street, Aberdeen’s main retailing thoroughfare, the premises are situated on the east side of George Street between its junctions with St Andrew Street and John Street in a well-established secondary location. This section of George Street is close to the Bon Accord Centre, which incorporates John Lewis and, as such, would be considered the prime section of George Street. While limited on-street ‘pay and display’ car parking is available within the immediate vicinity, the premises also benefit from three car parking spaces off Jopps Lane to the rear. The 930 sq ft ground floor unit is situated within a four storey and basement building. The retail area is open plan with a private office at the rear. The unit also contains a WC and a basement storage area. Rental offers of £15,000 are invited while a sale will also be considered. For further information please contact the sole letting or selling agent on tel 01224 202800.